Soft Skull Press, 9781593764166, 181pp. Channeling Steven Millhauser by way of George Saunders, The Great Frustration is a sparkling debut, equal parts fable and wry satire. 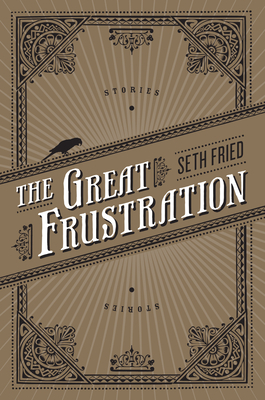 Seth Fried balances the dark--a town besieged, a yearly massacre, the harem of a pathological king--with moments of sweet optimism--researchers unexpectedly inspired by discovery, the triumph of a doomed monkey, the big implications found in a series of tiny creatures. In "Loeka Discovered," a buzz flows throughout a lab when scientists unearth a perfectly preserved prehistoric man who suggests to them the hopefulness of life, but the more they learn, the more the realities of ancient survival invade their buoyant projections. "Frost Mountain Picnic Massacre" meditates on why an entire town enthusiastically rushes out to the annual picnic that ends, year after year, in a massacre of astonishing creativity and casualty. The title story illuminates the desires and even the violence that surges beneath the tenuous peace among the animals in the Garden of Eden. Fried's stories suggest that we are at our most compelling and human when wrestling with the most frustrating aspects of both the world around us and of our very own natures--and in the process shows why he is a talent to be watched.